Dabyna describes himself as “the bridge linking the past, present and future of rock ‘n’ roll”. Adegoke Odukoya, better known as Adé Bantu (born 13 July 1971 in Wembley, London), is a Nigerian-German musician, producer and activist. He is best known as the founder of the Afro-German musical collective and NGO Brothers Keepers and as the front man of the 12 piece band Bantu. 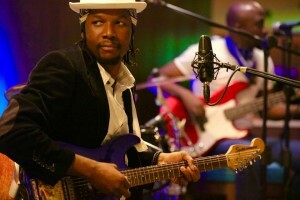 He received the Kora Award (the Pan-African equivalent of the Grammy) for his album “Fuji Satisfaction” in 2005. Born in London and partly raised in London, BOJ, full name Mobolaji Odojukan, has travelled to several countries like the USA, Barbados, Nigeria and France. Without doubt, this appetite for travel and the imbibition of experiences in the process has undoubtedly influenced his music further.